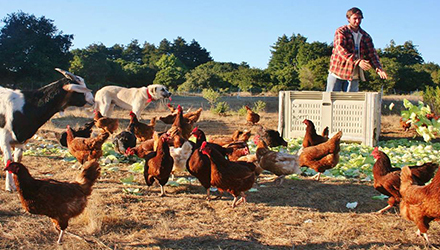 Pajaro Pastures was founded in 2011 by Ryan Abelson after he graduated from UCSC. We seek to reconnect the seemingly distant paradigms of ecology and agriculture. By reintegrating soil, plants, and animals we work to better understand ecological workings of our whole farm/ecological system to provide you with the highest quality products and while protecting and enhancing the environment. The majority of Pajaro's eggs are sold at farmers' markets while the goats are largely sold to HOME restaurant in Soquel. Pajaro Pastures vision is to consciously shift from the prevailing cultural ethics of disparity and disconnection to abundance and interconnection. The farm is 100% rain fed and utilizes integrated pest management through the release of beneficial insects. They do not use any insecticides or chemical control.